Summary : TradeRush is one of the most efficient trading platforms in the industry. It has a fantastic list of assets that traders can choose from and its education and customer support services are great. 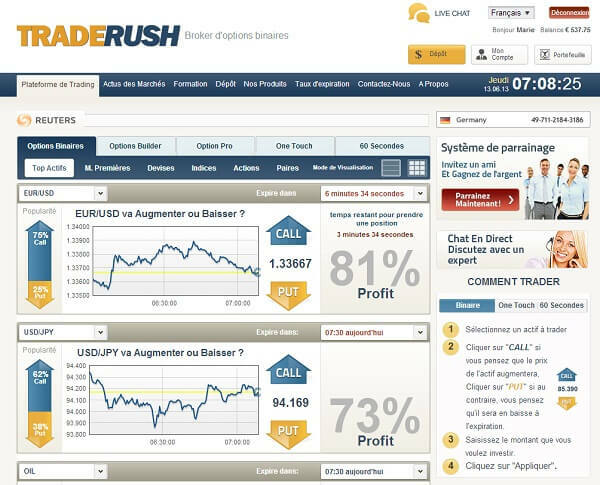 TradeRush is Binary Options Trading site that is well known for its professionalism to all the traders that have used it. 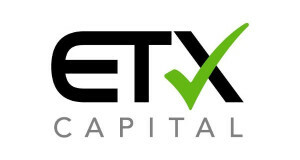 Established in 2011, it is regulated by the CySEC, making it an ideal option for many traders who worry more about the safety of their funds. Ever since it was launched, TradeRush has continued to grow and become a force in the market due to its high quality service offerings. Any trader looking for an innovative platform that has great services and still has so much to offer to the market should realize that TradeRush is the best option. 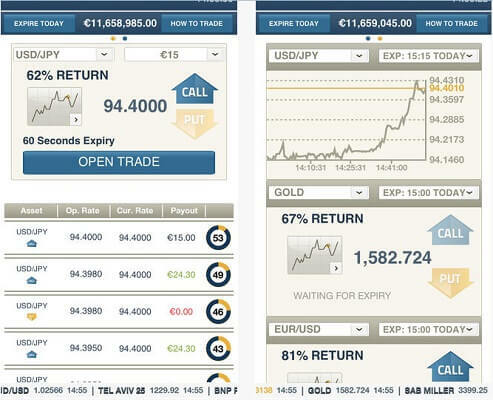 TradeRush is powered by SpotOption, which is a leading Binary Options Trading platform in the industry. As a platform it is easy to use, navigate and understand, making it appropriate for traders of all levels and mindsets, including the most cautious traders who want to be sure they are making the right decisions. TradeRush is entirely web based therefore you will not be required to download and install any software in order to register to start making use of the trading platform. All you actually need to do is getting going is to make a minimum deposit of $200 so that you can open an account. Mobile trading is possible with TradeRush through an application to a mobile device that uses either Android or iOS operating systems. Deposits to TradeRush accounts can be made in many ways including credit and debit cards, Skrill, Money Bookers and wire transfers. To maximize on deposits without worrying about a maximum amount, you should utilize wire transfers. However, should you choose to maximize your deposit with a credit card, the most you can put in your account is $20,000. There are eight currencies that you can use when making a deposit into your account. These are USD, EUR, GBP, CAD, JPY, AUD, RUB and SEK. Once you have chosen to use one currency, it is not possible to change it. Withdrawals can be accessed through various methods as well. TradeRush processes withdrawal requests quite fast and conveniently. You can expect to get funds in your account within 3-5 business days, depending on the withdrawal method you are using. Payouts on TradeRush mainly depend on the kind of trade made. On average, a trader can enjoy between 71% and 81% payouts. 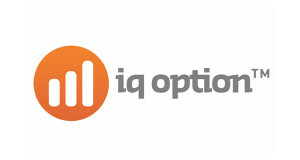 Traders using advanced options like OneTouch can enjoy up to 500% payouts on a good trade. Traders also get to enjoy a refund of up to 15% on their money. In addition to having all the standard features that you can expect from a good Binary Options Trading site, this site also includes The Double Up feature and the Roll Over feature. With these features it is possible to make alterations to the timing in a trade, giving a trader the opportunity to save themselves from a loss, or the chance to capitalize on the possibility of making a tidy profit. There are also excellent educational resources that are available on this site, which make it appealing for novice traders. Traders from all over the world can access the trades on this site, with exception of traders from the United States. There are a variety of options a trader can choose from on TradeRush and these include Call/Put options, 60 seconds Options, OneTouch Options, Option Builder and Option Pro. Furthermore, there are more than 140 assets available, a clear indication that there is something for every type of trader that visits this site. TradeRush takes its customer support services seriously. The platform has one of the best support teams you will get in the industry. You can contact them for help through Live Chat options, call back requests and emailing. There are also international support numbers provided for traders to call in case of an urgent need. The team is always at work, ready with information and always set to help. TradeRush is one of the most efficient trading platforms in the industry. It has a fantastic list of assets that traders can choose from and its education and customer support services are great. 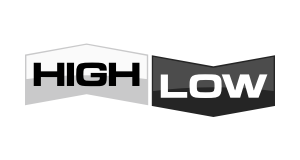 You can expect high returns once you start trading here.